Lt. David Cox, left, the Wright State police officer of the year, with Chief David Finnie. Lt. David Cox has been honored as the Wright State Police Officer of the Year. 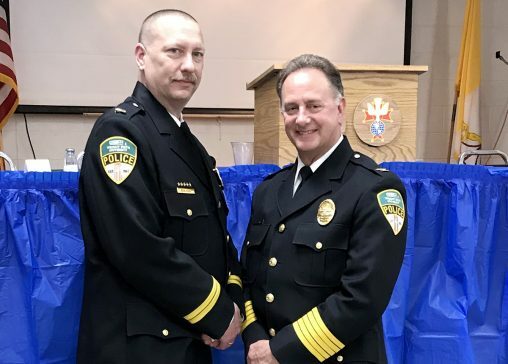 Cox, who has been a full-time sworn police officer at Wright State since 1992, currently serves as the administrative division commander and is part of the command staff. His duties include oversight in administrative areas such as the Emergency Communications Center, training, records and student patrol. He also plays an important role in Clery Act reporting, which enables students, faculty and staff to report crimes on campus quickly and effectively. Wright State Police Chief David Finnie said he greatly appreciates Cox’s service and holds him in high regard. Wright State police provide the highest level of law enforcement service to the university community and value dedication to service, integrity, respect, professionalism, courage and diversity — values that Finnie says that Cox exemplifies.